The latest CNC turret punch presses feature advanced servo drives that improve capability, productivity and energy efficiency over their mechanical and hydraulic predecessors. Like their traditional stamping-press cousins, turret punch presses have progressed in performance and reliability. Drive technology, from mechanical to hydraulic to electromechanical (servo), spearheaded improvements, with automation evolving to enable elimination of various secondary processes. Capabilities have increased to such a degree that it’s safe to say that straight punching represents only a fraction of duties performed by today’s CNC turret punch presses. Add to that the emergence of combination punching and laser machines, backed by accessories for sheet and part handling, and you have a quite formidable and flexible fabricator. MetalForming recently discussed turret-punch press evolution with Tim Brady, punching and combination-machine product manager at Amada America, Inc., Buena Park, CA. Brady describes technology advances for fabricators looking to upgrade their capabilities as well as maintenance considerations for extending machine life and ensuring optimum performance. The industry, and Amada in particular, notes Brady, has introduced new generations of drive technology over the years. The original punch presses featured mechanical drives—flywheel, clutch and brake—to activate the ram. “The mechanical machines, though limited in capabilities, were reliable and somewhat energy-efficient,” he explains. By the late 1980s, hydraulic punch presses gained a foothold, promising improved process control. 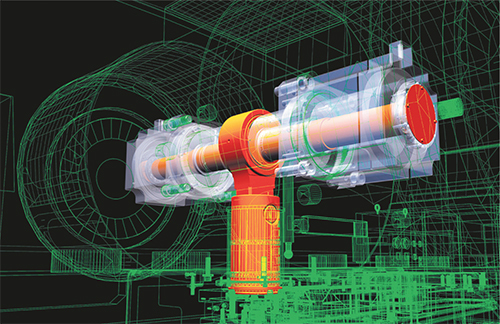 Servo drives, such as one diagrammed here, provide reliability and tight control of ram speed and depth, allowing for rapid, flexible production. By the mid-2000s, electromechanical servo-drive punch presses appeared. Similar to servo-driven stamping presses, these punch presses delivered the benefits of both mechanical and hydraulic machines. “This latest generation of punch presses is very reliable, with very low energy consumption,” says Brady, noting that Amada’s entire turret-press lineup consists of electromechanical machines. “Servo-drive technology brings the same reliability as offered by the old, simple mechanical punch presses, perhaps even greater reliability. And servo-driven punch presses retain all the features of hydraulic machines in controllability of the ram for speed and depth, and they run fast. Hydraulic turret presses also require more intensive maintenance, such as annual oil changes (more than one if the machine runs multiple shifts), with each change needing roughly 40 gal. of high-grade hydraulic oil and filters. All of that said, mechanical and hydraulic punch presses still find wide use, and if users stay up on maintenance, these machines can continue to perform, though access to replacement parts may be limited. Maintenance for punch presses begins with common sense. Keep up on standard periodic maintenance. 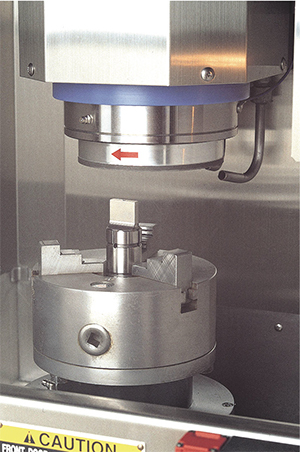 A tool undergoes sharpening in a machine designed specifically for turret-press tooling. Sharp tools will last longer (as a tool wears, the wear rate will speed up), protect against machine damage, and help ensure part quality and repeatability, so check for tool wear regularly after a predetermined number of hits. The latest turret punch presses help by providing tool hit counts. Just see how long your vehicle lasts without an oil change. Many machines feature maintenance-schedule warning systems that automatically alert operators. Critical is tool maintenance. Properly maintained tooling not only optimizes productivity and part quality, but also affects machine performance. Also key is keeping punches sharpened. Machines today can track tooling hit counts, helping users monitor and address tool wear. Combination turret-press/laser machines require additional maintenance; namely, keeping nozzles and lenses clean. Brady recommends checking them daily, as dirt and dust will negatively impact cut quality and speed. Lasers in combo machines also create dust when working with aluminum. When using a combo machine, Brady recommends prepunching the laser starting points. Doing so not only saves wear on the laser lenses but also cuts down on dust. CO2 lasers also require periodic checking and changing of chiller water and turbo-blower oil. Evolving CNC punch presses not only push the technology envelope to deliver improved performance, they can do so indefinitely if they get some TLC. Throw in some productivity tricks courtesy of Brady, such as these two tips below, and these machines will perform as promised well into the future while shrinking ROI time. 1) Optimize sequencing. Programming software offers automatic optimization and users should take advantage of it. Common programming punches one part in a nest, then continues to the next. Though ideal for first-part inspection, more efficient is programming an optimum toolpath for the entire sheet. Users can use both methods, creating first parts for inspection then switching to an optimum-toolpath program. For example, commonline punching, or one cut along the edge of two separate parts instead of separate cuts for each part, saves time and tool wear.